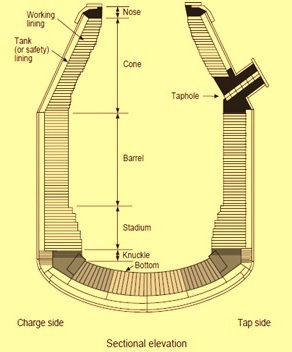 Typical refractory lining is shown in the converter cross section in Fig 1. Wear of refractory lining is due to either the individual or the combined effect of the following agents. Theoretically the refractory lining of a converter is to be designed by the refractory type and different thicknesses so that no material is wasted at the end of the converter campaign. These mean all the zones (Fig 2) of the converter lining is worn out to the stopping thickness at the same time. But in practice this does not happen and the refractories in some zones are worn out faster than the refractories in other zones. A balanced lining design is always aimed to improve lining life at the optimum refractory cost. A balanced lining is the lining where different qualities and thicknesses of refractories are used in different zone of the converter after careful study of the wear pattern of the refractories in the converter. This type of lining is also called zonal lining since in such type of lining the refractories are zoned such that a given segment of lining having lesser wear is assigned a lower quality or less thickness of refractory. Similarly refractories of greater wear resistance and normally having higher cost are assigned to those segments of the converter lining which are having higher wear pattern so as to have longer life of these severe wear areas. Refractories qualities normally used for converter lining ranges from tar bonded dolomite, pitch bonded dolomite and pitch bonded magnesia to the advanced refractories that are made with resin bonds, metallics, graphites and sintered and/or fused magnesia that can be 99% pure. Refractories are made to have combination of properties to withstand high temperatures and rapid changing environment condition during a heat in a converter. A balance of properties such as hot strength, oxidation resistance and slag resistance are expected from converter refractories. Presently Magnesia carbon (Mag-C) refractories are most popular refractories for converter lining. Laser measuring – It is a technique which is used for the measurement of lining thickness with the help a laser beam. For this purpose special laser measuring machines are available. It is advisable to measure the lining thickness once a day to know the lining profile of the converter during its operation. When the lining thickness is reduced to a level of 127 mm then the implementation of lining maintenance techniques should start. Magnesia levels – Magnesia (MgO) is a very important factor for improving the lining life. The objective is to charge more MgO than the saturation level of the slag at the operating temperature. Higher MgO slag also has improved coating characteristic during slag coating and improved slag sticking during slag splashing. The magnesia sources are low cost magnesia source. Used basic lining material can also be used for this purpose. Based on the tapping temperatures the MgO levels in the steel making slag is kept 10% to 12% in Indian conditions. Slag coating – Slag coating is basically a technique of rocking the converter for creating a working lining of slag. It is an art which requires a considerable attention during converter operation. Actions for the slag coating practice to succeed are i) selecting the right type of slag ii) slag conditioning by right and proper amount of additions iii) correct rocking of the converter iv) disposing of the slag when necessary v) coating when it is best time. These items are to be well planned and correctly executed for proper slag coating. The key to the successful slag coating is to follow the established rules. Slag splashing – Slag splashing technique, a relatively recent development, has contributed to major enhancement in the converter lining life. Slag splashing as the name suggests, utilizes residual slag from the steel making process, which is conditioned, to provide a coating on the refractory surface to act as a wear lining in the subsequent blow. Liquid viscous slag is blown by means of high pressure nitrogen into the upper part of the converter (cone) where it sticks to the converter working lining. Slag splashing technique needs few minutes of the converter time after the tapping of the previous heat and before the start of the next heat. Slag splashing technique has been developed to counter the erosion and produce a freeze lining in a converter. Splashed slag acts as a working lining during subsequent heats. It is become a powerful tool for increasing of the lining life of the converter. It entails the use of oxygen lance to blow nitrogen on the residual slag.Two slag splashing practices are known namely i) with the converter empty of steel and all the slag inside the converter ii) with both the molten steel bath and slag in the converter. The second method is mainly used for coating the trunnions and the upper portion of the converter. The blowing practice is different in two techniques. Slag splashing needs 2-3 minutes and is done with converter in vertical condition. Nitrogen flow is controlled based on the lance height and is usually automated. Gunning – This technique helps to attain an extended life on a lining. It consists of gunning refractory material normally a monolithic on the areas that encounter severe wear out such as trunnions and the slag line. Gunning is usually done only on the selective areas. A shooter type of gun is used for the gunning process to encounter hostile environment of the process. Gunning materials are normally water based. A lot of research has been done on the gunning materials and its quality is being improved continuously. Since gunning material has a cost. the amount of gunning is to be balanced with the specific cost of the refractories during steel making. i) In a converter lining usually two layers of refractory bricks are used. This consist of a thinner safety lining to protect the shell usually of thickness ranging from 150 mm to 225 mm and a thicker working lining usually of thickness ranging from 450 mm to 750mm. A large part of the safety lining will last a number of the working lining campaigns. The safety lining is held in place with steel retainer rings and mortar. ii) The lining of the converter is cooled after the campaign is over and the remaining spent working lining is removed by mechanical means usually using a de-bricking machine. The removed refractories are allowed to fall by rotating the converter to an inverted position. iii) The repair of the damaged portion of the safety lining is carried out and the working lining is installed without mortar. The wear conditions in the different zones of the converter and the type of refractories recommended for use is given below. Bottom – The erosion of refractories in this area is by molten metal, slag and gases. Thermo mechanical stresses are developed in a bottom blown converter as a result of thermal gradients between the gas cooled tuyeres and the bottom lining. Magnesia carbon lining does not provide an enhanced performance in the area of converter bottom. In case of deep blowing during the heat there is faster wear out of the bottom. The bottom repairs during the campaign are normally carried out by building of the bottom with dolomite enriched viscous slag or patching the bottom with mixture of liquid slag and broken basic bricks. The combined blowing operation in the converter causes high stress on the bottom and for this reason fired magnesia refractory blocks with modifiers and pitch impregnation are normally used in this area. Bottom Tuyeres and its surroundings – Bottom blowing and bath agitation through tuyeres contributes to localized wear of the refractory materials in the surrounding area. The wear is due to the turbulent flow of molten steel giving rise to erosion of the refractory and also due to the thermal stress caused by the flow of the cold gases. High dense and with low porosity pitch bonded and impregnated Magnesia carbon refractory blocks based upon fused magnesia are preferred for this application. 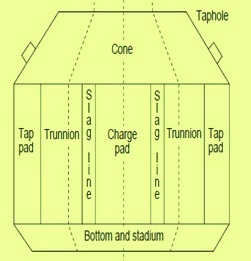 Charge pad – Charge pad in the converter is normally directly opposite the tap hole, although in some converters, charging and tapping are carried out on the same side of the vessel. The charge pad is subjected to impact load by falling scrap, sometimes of heavy nature such as bloom ends. Molten metal also cause erosion of the charge pad. In addition, sampling probes and temperature probes are introduced from this side of the tilted vessel and this leads to slag at high temperature carrying out the washing of the charge pad area. Initial refractory solutions to the charge pad were found with pitch impregnated fired magnesia blocks. As converter lives increased owing to the use of magnesia carbon materials, the charge pad became a major wear area, and resin bonded magnesia carbon with metal additions are being used to get good performance. These materials offer good resistance to impact, provide resilience coupled with strength, and resistance to slag ingress owing to the presence of graphite. Tapping area – The tapping area is subjected to erosion by liquid steel at high temperature and subject to corrosion by liquid slag. Refractory development in the tapping area has been on the lines of the development of the charge pad area. The earlier materials are being replaced with pitch bonded and impregnated magnesia carbon with metal additions. Since the dominant wear process in the tapping area involves high temperature slag attack, refractory blocks manufactured from large crystal sized magnesite are rapidly becoming the standard. Pitch bonded and impregnated refractories have been found to give superior performance in the tapping area due to the reduction of penetrating slag oxides by the action of carbon in the refractory block porosity. Slag zone crossover – This area of the converter lining, which is situated at the intersection between the lower tapping area and upper level of the static bath, is very complex since it is subjected to several modes of attacks such as slag attack, high temperature and erosion. All these attacks take place during the tapping of the converter. Refractory materials with resistance to high temperature slag attack along with oxidation resistance are must for the lining of this area. Pitch bonded, impregnated magnesia carbon based upon large crystal size magnesite, high purity flake graphite and containing metal additions has given good results. Use of high purity graphite flakes is particularly useful since it limits ‘self oxidation’ by the impurity oxides inherently present in graphite flakes. Trunnion zone – Trunnion zone of the converter is the most difficult to maintain since it is on the rotational axis and thus incapable of slag washing. Wear of the refractory material is primarily by loss of the working face by oxidation of the carbon bond. Gunniting of this area of the converter is the only practicable method of maintaining this area and refractory blocks with high resistance to oxidation are preferred. Main barrel – Main barrel of the converter may be conveniently divided into two areas namely the knuckle and the upper sidewall. i) Knuckle – The knuckle area in the converter is often a major wear area, although design changes are often effective in improving performance. The knuckle area is mostly subjected to severe slag attack, particularly when the converter is not being blown. It requires refractory materials with very good resistance to slag corrosion and erosion. ii) Upper sidewall – Upper sidewall of the converter is subjected to slag attack, but also to the extremes of temperature cycling. Materials which have good slag resistance are used in this area. However the refractory lining in this area should also be capable of taking and retaining a slag coating. Sampling slag line – Areas of the cone distributed either side of the charge pad are subjected to preferential attack by slag when the vessel is tilted for temperature measurement and for sample probe dips. Pitch bonded impregnated Magnesia carbon give good performance in this area of the converter. Cone – The cone area is subjected to high temperature erosion by high velocity gases carrying with them entrapped particles. There is oxidizing atmosphere. Resin bonded Magnesia carbon materials give good performance in the cone area. Upper cone – In the upper cone, the top six to ten rings, the wear mechanism is modified by loss of refractory material during skull removal. Damage to refractory bricks in the upper cone occurs during mechanical deskulling either progressively by loss of brick ends or by dislodgement of whole bricks. Refractory materials with high resilience combined with strength and oxidation resistance are a prerequisite for this area of the converter. Pitch bonded, impregnated magnesite, sometimes provided with co-moulded metal plates, which expand during oxidation and tighten the brick rings, is the most successful refractory material in this area. I am experiencing excessive wear in the stadium area of my oxygen converter from just above the floor area. Ramming area is also affected. The chemistry did not change. I am concerned about lance gap and bottom blow flows. Do you perhaps have more information or wear diagrams on this?